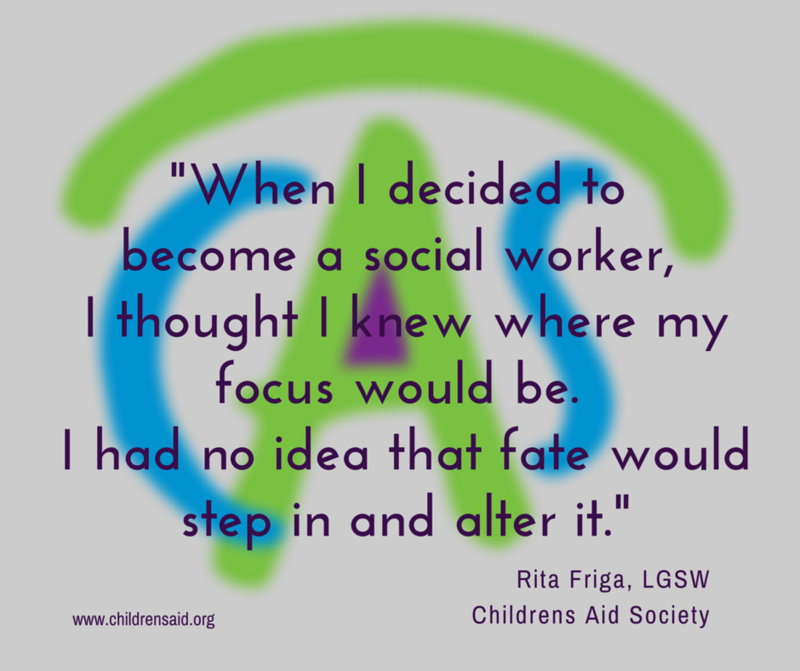 To end our series highlighting social workers, Rita Friga, a social worker at Children's Aid Society, shares her path to becoming the social worker she is today. When I decided to become a social worker, I thought I knew where my focus would be. I had no idea that fate would step in and alter it. After my first job in my field of specialty of Employee Assistance (EAP), my course changed and I became an advocate for victims of domestic violence and sexual assault. As it happens, it was exactly where I was meant to be. Through a series of changes and luck, I find myself advocating for children in the child welfare system who are victims of abuse. I also often become an advocate for the parents, who have a high probability of being abuse victims themselves. Working with trauma victims has been happening for a long time. However, studies showing the impact of trauma on child development are relatively new, along with skilled instruction in helping victims heal from trauma. This is the basis of Trauma Informed Care, a practice embraced by Children’s Aid Society. To be successful advocates, the best chance of helping our victims is to provide trauma informed services. This is relatively new approach and is in high demand. Often we head to school, thinking we know where we want to focus. As I did, many social workers end up following a different course through choice or accident. I encourage new social workers to take a look at the area of Trauma Informed Care. What I’ve learned about childhood trauma’s impact on society is astounding! To learn more about it, review the Adverse Childhood Experiences Study (ACES) at http://acestoohigh.com/got-your-ace-score/. You can even get your own ACE score.